... well officially unofficially. If you haven't heard the breaking news, Father Leo Patalinghug now has a Youtube Channel and Tumblr. Since we here at Be the Straw are all about social media, we figured this would be noteworthy to feature - that, and we're hoping Father Leo might hook us up with some of his mouth-watering fajitas someday. Some of y'all may not know anything about Father Leo, allow me to assist. I actually met Father Leo once at WYD Sydney, but with his popularity he probably met a million people that trip, and he most likely doesn't recall some random fellow Filipino guy who was applying to the seminary and was superexcited about his dancing ability. Still, from the little that I did interact with him, he was a chill man of the faith. I also have a few seminarian friends who were/are students of Father Leo - he is the Director of Pastoral Field Education at Mount St. Mary’s Seminary in Maryland - and they've all said great things about him. But that's not all, he's a 3rd degree Martial Arts instructor, he has danced and choreographed for award winning dance crews, and he hosts his own cooking show - you may have seen him on Throwdown with Bobby Flay. Follow Father on Youtube and Tumblr. Hit the jump for more Father Leo videos, and a more in depth bio. Born in the Philippines and raised in the Baltimore area, Fr. Leo actually developed his love for cooking while attending the seminary at the North American College in Rome. There, he became friendly with several Italian restaurant owners and would often invite them back to the student kitchen to trade cooking secrets. They would teach him about rigatoni and lasagna; he would show them how to make hamburgers and ribs. Today, he is a skilled cook who still enjoys learning how to make new dishes, and loves the process of preparing a meal, as much as he does sharing it with a table full of friends. Fr. Leo was ordained in 1999 and served as a parish priest for five years at St. John’s Church in Westminster, Maryland. He was often invited to his parishioners’ homes for dinner. To their surprise, he would turn the table and cook for them, using these opportunities to build friendships and engage in relaxed conversations in the kitchen. Those memorable and unstructured times spent making a meal together provided the inspiration for Fr. Leo’s first book, Grace Before Meals: Recipes for Family Life. Currently, he is a member of the faculty at Mount Saint Mary’s Seminary where he directs the Pastoral Field Education Program for future priests. Before becoming a priest, Fr. Leo pursued degrees in writing and political science with the intention of studying law and journalism at the University of Maryland. He also taught high school speech, debate and drama. Along with his brother, he founded a martial arts school in 1988. Fr. Leo studied philosophy at Theological College at Catholic University in Washington, DC. He holds advanced theological degrees from the Pontifical Gregorian University and Pontifical Maranium Institute in Rome. 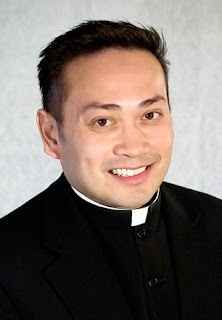 A popular conference speaker with a growing national reputation for his ability to connect with teens and their parents, Fr. Leo has appeared at events across the United States and Canada. His enthusiasm has frequently earned him invitations to return and speak about topics like the theology of beauty, teen spirituality, spiritual combat and praying as a family. Along with cooking, Fr. Leo’s hobbies include writing, singing and jogging. He especially enjoys traveling, viewing it as an opportunity to broaden his multilingual talents. He holds a black belt in Tae Kwon Do and has won a national competition in Arniz, a form of full-contact stick fighting. He also enjoys working with students in youth groups and on college campuses, as well as actively participating in prison ministry work. And here are just a few Fr. Leo vids.